A translation of the German name of this snail means "Back of a turtle". I think it looks more like a sponge or like ascidians than like a turtle! 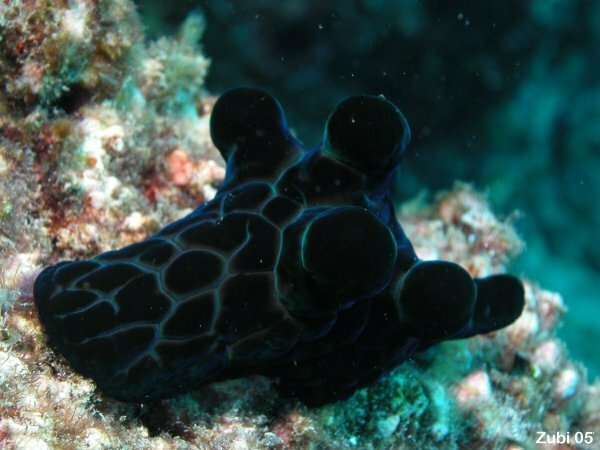 There are some black or brown sponges such as Spirastrella vagabunda or Plakortis nigra that look very similar in color and structure. Look at this velvetsnail (Coriocella sp.) which is very similar, but brown in color. On first impression, the dive site, Lapus Lapus is not very spectacular. But it is amazing how many different species of nudibranchs can be found at this place. There is a small overhanging cavern. The roof was just full of nudibranchs eating the hydroids, sponges and ascidians there. The velvet snail (two different species) can be found on sand or rubble near by.